If you’re unfamiliar with wall safes, they’re basically safes that are securely placed inside a wall. Obviously, a wall safe has a lot of differences than a regular home safe, which stems from the initial idea of how to store the safe. Although wall safes and traditional home safes are both useful and durable, wall safes tend to be the better option. Wall safes are generally easier to install and hide, provide just the right amount of accessibility and extra security, and have a decent amount of space to store your most prized possessions. That being said, continue reading to learn why most people prefer wall safes over ordinary home safes! One of the main reasons why people prefer wall safes over regular home safes is the fact wall safes are easy to hide. All you need is a large piece of furniture, painting, picture, or other decoration, and your safe will instantly be disguised. On the other hand, a typical home safe is harder to conceal because it is typically large and bulky. Also, traditional home safes are generally free standing. In other words, a home safe just stands by itself wherever you place it. It doesn’t have its own nook or designated space like a wall safe has. When comparing the two kinds of safes, it’s better to have a wall safe because it’s easier to hide than a home safe. After all, it’s better to choose a wall safe because there is an extremely low risk of a burglar being able to find a wall safe. Aside from the fact a wall safe is easier to hide, a wall safe generally has more bolts that are better placed and stronger than bolts in home safes. This means if a burglar does gain access to your wall safe, there’s an extremely slim chance they will be able to break into your wall safe. Another useful security feature is the fact that wall safes are not portable. 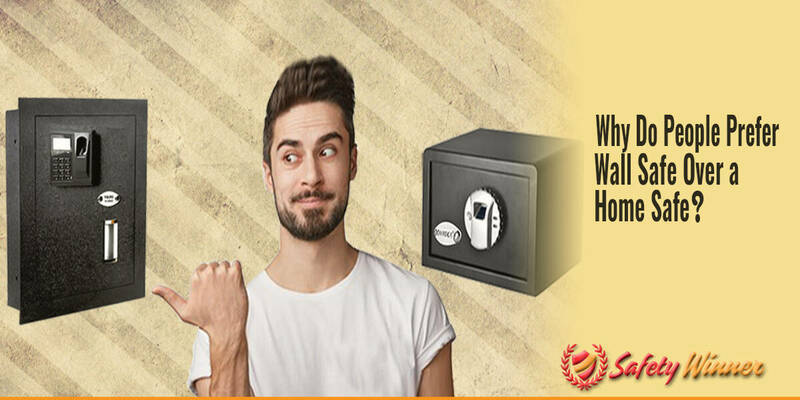 Since wall safes are built and secured inside walls, there is no way a burglar would be able to grab your wall safe and flee from your house. On the other hand, it’s easy for burglars to grab a free-standing home safe and flee from your property. Although the installation process seems to be initially overwhelming, all of the steps contribute to the ending product, which is fantastic and secured. For starters, it should be known that you are going to have to cut your wall in order to install your wall safe. Unlike wall safes, home safes have quick and easy installation processes that anyone could do. This is largely because home safes typically do not require any installation because they’re free standing. So, instead of wondering how to do it yourself or which professional to hire, you can simply plop your home safe anywhere and call it a day. That being said, the installation process isn’t something that anybody could easily do themselves. In other words, if you want to ensure that your wall safe is extremely secured, durable, and functional, then you should hire a professional to install it. This makes installation extremely easy and mindful because at the end of the day, if you choose to hire a professional to install your wall safe, you won’t have to worry about going through the long installation process by yourself. Also, you can have peace of mind knowing that your wall safe is extremely secure and won’t budge in the event that someone attempts to break into your safe. Although this installation process is extremely simple and easier to do than installing a wall safe, home safes don’t have the extra protection and security that a wall safe does because they aren’t installed with a professional. Therefore, there is a lower chance of having an extra safe and secure safe unless you get a wall safe. Accessibility is another aspect that differs greatly among wall safes and traditional home safes. Generally, wall safes are more accessible than traditional home safes because they are usually on eye level on an easy to access wall instead of in the corner of a random closet or under a bed. On the other hand, wall safes are inaccessible to anyone or anything that they don’t want using their safe. This is great for people who have small children. Therefore, you won’t have to worry about your little one accidentally exploring the fire-arms you keep in the safe. Lastly, wall safes and traditional home safes differ on the amount of space they take up and what they can hold. Generally, wall safes take up less space and therefore can hold fewer items than traditional home safes. This makes sense. Just take a second and think about it. After all, wall safes are meant to store your most prized possessions inside your wall. So, don’t expect to be able to fit a ton of stuff in your wall safe because you have limited space. On the other hand, a traditional home safe can be virtually any size. Therefore, it has the ability to take up a decent amount of space and then an overwhelmingly large amount of space. This also means that traditional home safes have the potential to have a ton of available space inside them. So, you can fit and store virtually anything inside. Therefore, if you have the opportunity to decide whether you want a wall safe or a traditional home safe, you should choose a wall safe. You can hire a professional to install it for you. Then, you will have peace of mind knowing you have a resilient and durable wall safe that a burglar won’t be able to access.